The Punjab minister’s recent remark questioning the Chief Minister’s authority has created a rift in the state Congress. 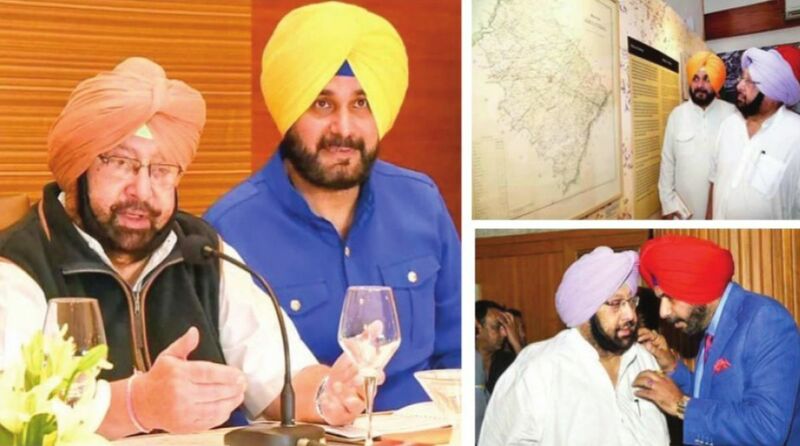 The recent controversy over Punjab minister Navjot Singh Sidhu’s visit to Pakistan for the foundation laying ceremony of the Kartarpur corridor and his subsequent remark ‘Amarinder Singh is an Army Captain’ appears to have created a division in the Punjab Congress with the chief minister’s loyalists up in arms over Sidhu’s attempts to project himself as larger than virtually everyone else in the state unit. Following the Congress high command’s intervention, the crisis has been defused for now but party leaders suspect this truce between the CM and Sidhu may not last long as the ambitious minister does not hesitate to indicate his desire for a larger role in state politics, much to the discomfort of many in the Congress. Sidhu left his mother party, the BJP, after he got into a bitter personal battle with the BJPally Shiromani Akali Dal (SAD) and the saffron party refused to dump its old alliance partner as demanded by the cricketer-turned-politician for his continuation in the party. Having unsuccessfully tried to get a prominent role (read chief minister’s post) in the Aam Aadmi Party (AAP) ahead of the 2017 Punjab Assembly polls, Sidhu then joined the Congress through direct intervention of the party high command, including Rahul Gandhi. Once the Congress returned to power under the leadership of Amarinder Singh, Sidhu is believed to have unsuccessfully made the case for getting the deputy chief minister’s post. But Amarinder made sure Sidhu remained at number three behind the senior most legislator and health minister Brahm Mohindra. Ever since, Sidhu has lost no opportunity to resume his battle with the Prakash Singh Badal family and unsuccessfully tried to make the CM take action against them for alleged wrongdoings during the decade long SAD-BJP rule. But as Amarinder has refused to act in the absence of proof, a visibly upset Sidhu appears to have made it his top agenda and he has been hogging the limelight for his tirade against the Badals. In the process, Sidhu appears to have upset some of his party colleagues who believe he is taking the anti- Badal campaign a bit too far instead of focusing on governance and delivering results. In yet another instance of Sidhu’s inclination to chart his own course, he went to the Kartarpur ground-breaking ceremony to Pakistan even as the CM declined the invitation. After the controversy erupted over it, Sidhu went on to question the CM’s authority by stating that “Rahul Gandhi is his captain” and that Amarinder Singh is only an Army Captain. This comment made at least five Punjab ministers openly criticise Sidhu and suggest he resign from his post in the Amarinder Singh government if he could not look upon him as the leader. “Amarinder Singh is our undisputed leader. He is captain of the party in the state. He was chief ministerial candidate in the last assembly elections and under him the party returned to power with an overwhelming majority. At the same time, Rahul Gandhi is captain of entire Congress, no one is disputing this fact. But what Sidhu has said about captain sahib is unfortunate,” a minister said. The forests minister Sadhu Singh Dharamsot also demanded Sidhu apologise to the CM. He also reminded him he was not running a comedy show. Sidhu had been a part of a popular TV comedy show aired in India. “It seems Sidhu sahib has forgotten that he is a minister. He should know he is not running a comedy show here. He must learn how to respect the elders and seek an apology from the chief minister,” Dharamsot said. Earlier rural development minister Tript Rajinder Bajwa said “Rahul is the captain of the entire Congress but Amarinder is the undisputed leader of the Punjab Congress,”. “The tone and body language used by Sidhu for the CM was humiliating and disgusting. He has no moral right to continue as minister,” he added. Revenue minister Sukhbinder Singh Sarkaria said the tone and tenor Sidhu used for the CM was insulting and he should quit if he did not want be a part of Amarinder’s team. Cabinet minister Rana Gurmeet Singh Sodhi said if Sidhu feels the CM is not his captain, he should give up the position he occupies in his cabinet. Rattled by this backlash, Sidhu became defensive by talking about personally meeting Amarinder and clearing the confusion. “You do not wash your dirty linen in public. He (Amarinder Singh is a father-figure, I love him, respect him, I will sort it out myself,” he said after getting a clear signal from the CM’s camp that defiance or disrespect to Amarinder would not be tolerated. A timely intervention by the Congress may have avoided the controversy getting uglier, but it is doubtful that Sidhu would maintain a low profile for long.